Chana chaat, a protein rich healthy snack made from kabuli chana (chickpeas) and basic chaat ingredients is a perfect snack food for kids lunchbox. To mkae this chaat, boiled chickpeas (or canned) are tossed with boiled potato, tomato, onion, khajur imli ki chutney, green coriander chutney, chaat masala powder and coriander leaves, and then garnished with sev. If you have the leftover boiled chickpeas or canned chickpeas and chaat chutneys are ready then it will hardly take 5 minutes to assemble all the ingredients. 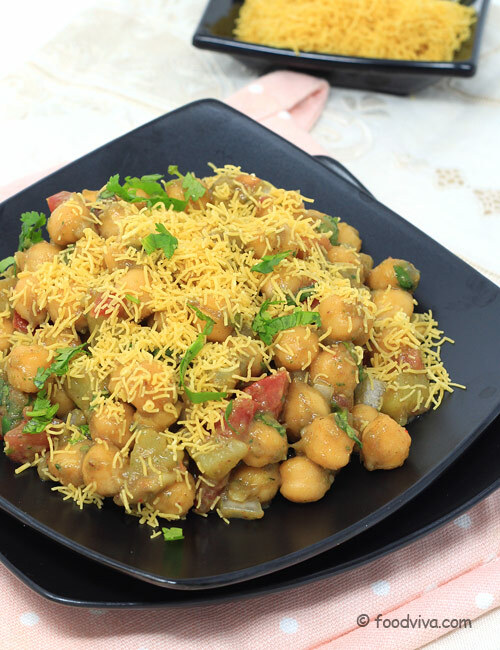 You can also make the kala chana chaat using the same recipe, just use kala chana(black chickpeas) instead of kabuli chana(white chickpeas) and add other chaat ingredients as per your preference. Follow the below given recipe with step by step photos and don’t forget to read tips for more ideas before making this healthy and quick chaat. 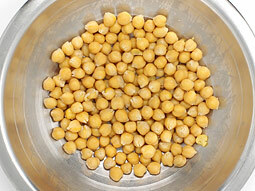 For 1¼ cups boiled chickpeas – Drain water from soaked chickpeas and transfer them in a pressure cooker. Cook them in salted water for 4-5 whistles or until soft over medium flame. 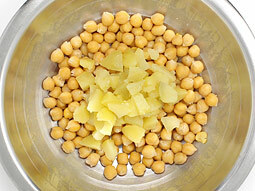 Boil chickpeas and potato together to speed up the process. Don’t forget to add salt while boiling the potato to get even salty taste. Drain the water and add boiled chickpeas in a bowl. Add 1/2 cup chopped potato. 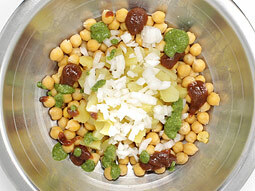 Add 1/3 cup finely chopped onion, 1 tablespoon green chutney and 2 tablespoons sweet khajur imli ki chutney. Add 1/3 cup finely chopped tomato. Add 1/2 teaspoon chaat masala powder and salt (add only if you have not added salt while boiling the chickpeas and potato). Add 2 tablespoons finely chopped coriander leaves. Mix well and taste for the seasonings. 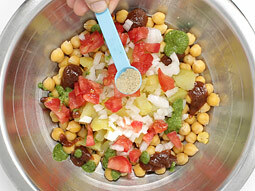 If required, add more chutneys or salt as per your taste and mix well. Transfer chaat mixture to two individual serving plates or bowls. Garnish each plate with 2 tablespoons sev. 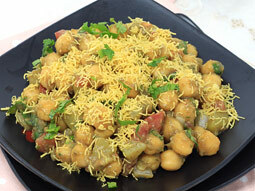 Aloo Chana chaat is ready for serving. Serve it immediately for better taste. To serve this chaat in the party, mix all the ingredients except for the sev and keep it in a large bowl or individual serving bowls. Either garnish with sev just before the serving or serve as it is. 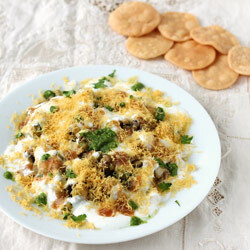 For Spicy Chaat, add 1/2 teaspoon red chilli powder and 1 chopped green chilli in step-5. For variation, garnish chaat with whisked dahi(yogurt/curd) and finely chopped mint leaves to make Chana Chaat recipe with yogurt. If you want to serve this chaat as a salad, skip adding both chutneys and add lemon juice, finely chopped green chilli and chopped cucumber. 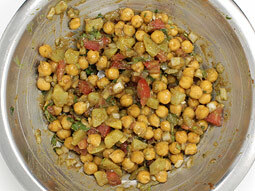 You can also use black chickpeas(kala chana) instead of white chickpeas(kabuli chana). 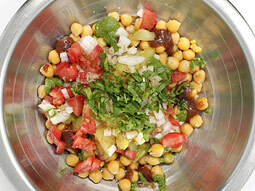 Serving Ideas: Serve chana chaat with your favorite milkshake or smoothie in the breakfast or as the afternoon snack. It can be also packed as a healthy and stomach filling food in kids lunchbox.